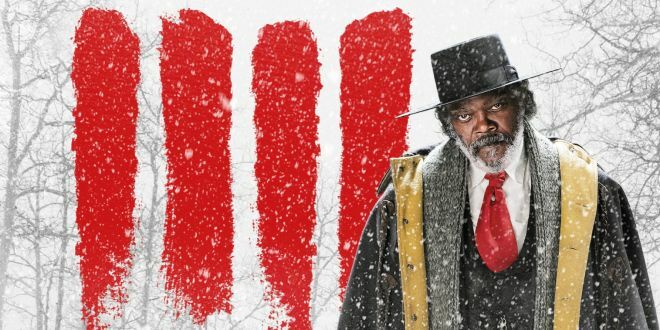 Home / MOVIES / [NEWS] Where to see The Hateful Eight (2015) in Ultra Panavision 70 in France? [NEWS] Where to see The Hateful Eight (2015) in Ultra Panavision 70 in France? Even if he wanted it shown in Ultra Panavision 70, not all French cinemas have the equipment necessary to project films in the format which Quentin Tarantino wanted so much for The Hateful Eight, to be see in. French film distributers SND (Société Nouvelle de Distribution) have certified a number of cinemas around the country, and we have the list below. Several years after the American Revolutionary War, bounty hunter John ‘The Hangman’ Ruth (Kurt Russell) is escorting Daisy Domergue (Jennifer Jason Leigh) to Red Rock where she is to be hanged. Along the way the pair encounter former soldier Major Marquis Warren (Samuel L. Jackson) now also a bounty hunter as well as Chris Mannix (Walton Goggins), the new sheriff of Red Rock. Forced to take shelter from a sudden blizard, they find themselves in a mountain cabin in the company of four intriguing characters: Sanford ‘The Confederate’ Smithers (Bruce Dern), Bob ‘The Mexican’ (Demian Bichir), Joe ‘The Cow Puncher’ Gage (Michael Masden) and Oswaldo ‘The Little Man’ Mobray (Tim Roth). Even as the storm looms over the mountouns, the cabin becomes the scene of a series of schemes and betrayal. One of this hateful eight is not what he seems to be… it’s would be easy to put money on no one leaving the Minnie’s cabin alive. Used until 1966, Ultra Panavision 70 is an extra-large image format, the aspect ratio 2.76:1 (three or four times larger than 35mm film) was used to film Lewis Milestone’s Mutiny on the Bounty (1962), Anthony Mann’s Fall of Roman Empire (1962), and… The Hateful Eight (2015) by Quentin Tarentino. 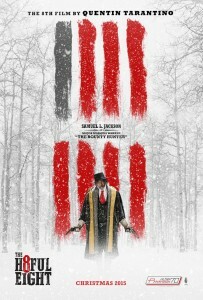 Tarantino’s return to past photochemical technology in this wintery western, goes hand in hand with the particular nature of the film-premier scenography, as the cinema release includes an overture and intermission. James Cameron’s Titanic (1997) also imposed an intermission, though this was due to it’s duration (195 minutes). The Gaumont Marignan in Paris – 04/01. The 70mm version will also come with a musical overture, an intermission of around 10 minutes, and about 8 minutes more footage than the what cinema-goers will see in other cinemas. 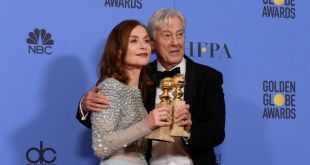 For the moment, however, it could be end up that this particular presentation will only be put on at the Gaumont Mairgnan in Paris from the 6th of January 2016 onwards, the release date of the film. Here’s to hoping that other cinemas reequip themselves before the 6th. Addicted to movies, plays, series and to culture in general, I like the works that surprise me.